With the right strategy, tactics, and software you can build a lead generation machine that works to expand your reach and grow your business. You know, everyone’s goal. Fortunately, lead generation software is not reserved only for fortune 100 companies. There are plenty of affordable lead generation tools to help you catch those leads and subscribers. The only problem is sifting through the massive amount of software available. Search Google – you’ll get thousands of hits. We spent hours finding, narrowing down, testing, and categorizing 75 of the best lead generation tools you can use to grow your business. It’s important to note that a tool is only half the battle. Your lead generation efforts may be limited (or enhanced) based on what industry you’re in. Real estate has the lowest conversion rates while business consulting has the highest conversion rate. Here’s are the types of lead generation tools so you can quickly move around the article. For each of the lead generation tools, there’s a detailed description and a bit of extra information to help you make an informed decision. Keep this in mind when you set expectations about the lead generation tools you choose. What to look for in all lead generation tools. Before we get into the thick of it, I just want to quickly run through what you simply need to consider for each type of lead generation tool. It should not take more than a few hours to learn and understand the lead generation tool you’ve chosen. Also, it shouldn’t force you to rearrange your entire workflow. I’ll admit, there are some exceptions to this rule like some sales tools are made to become the core of your workflow. You also shouldn’t need a developer to get value out of the tool you chose. That’s a big red flag. Setup should take, at most, a few minutes. Those are really the only two factors written in stone. Other categories of tools have different needs as well. Every business loves to have more high quality leads, am I right? Lead capture software is built to turn the web traffic into leads and subscribers. They capture leads using different methods like popups, surveys, quizzes and polls. It’s the bridge between website traffic and a thriving business. You’re able to capture those leads and follow up with sales tools or email marketing automation tools. There are many criteria you can use to evaluate whether lead capture software is a good fit for you. Another important consideration is whether or not the software integrates with your current marketing stack. Will it seamlessly send lead data to your CRM or ESP? If they don’t have the integration are they responsive to your requests to add new ones? Does the software do what you need it to? This is the first question on the minds of most people who buy lead capture software. Of course, you may need more features in your particular situation. That’s perfectly alright. The reports need to be good enough for you to make data backed decisions. Are the reports accurate? I once used a piece of list building software (it won’t be named) that captured roughly half my conversions. The contacts that showed up in my ESP were for the lead magnet I was promoting were more than what we reported. Once I figured it out, I got rid of the software as soon as possible. Cost is always a consideration when you want to buy software for your business. Assuming you know your numbers, the cost associated with lead capture software is negligible. When you know your numbers, you can put a value on each lead. Say it is worth $5. If your lead capture tools bring in 100 new leads that’s a value of $500 to your business which makes it a profit center as opposed to costs. In fact, most conversion optimization tools yield at least 2x ROI. Kyleads – smart popups and beautiful quizzes for lead generation – is lead capture software that allows you to create popups and quizzes to turn a larger number of website visitors into subscribers and leads. Kyleads combines standard popups with high performing quizzes which have an average conversion rate above 30%. Both the quiz builder and the popup builder are easy to understand so you don’t have to spend hours learning new software. The targeting options give you the ability to make better messages for your visitors. Select from page level, timed, URL parameter and others. It’s embeddable on most website platforms like WordPress, Shopify, and Wix to name a few. Just copy your form or quiz embed code and paste it where you want it to appear. Kyleads integrates with the major email marketing software providers. One of the most useful features is the ability to segment new leads based on their answers. You can add them to specific lists or tags in your email marketing software. KyLeads has straightforward split testing. Split testing lets you run different forms head-to-head at the same time, so you can pick the best version. The lead capture reporting options allow you to understand more than just views and generated leads – you can also see quiz starts, completions, and which questions were answered. It’s more of a lead generation platform that combines multiple software options. KyLeads starts with a 7-day free trial then $39/m. Special offer for readers of EmailVendorSelection.com. Get 25% off any KyLeads plan for life. To claim your lifetime discount, visit this page. You should be up and running in less than five minutes. Hellobar – converting more visitors into customers – is an old staple in the lead capture space. They have the features you’d expect in this type of list building tool. In addition to the ability to collect email addresses, it also allows you to funnel traffic to specific pages, talk to visitors, make announcements, and promote your social channels. It has a neat feature which makes the submit button shake to draw attention. They have a few tested templates and a feature called “leading question” which lets you add a starting question before the opt-in form. Be sure to choose the right question because it shows a popup afterwards no matter what your visitors answer. For example, if you ask “do you want exclusive tips?” They’ll still get a popup after answering no. Hellobar integrates with the major email marketing services and Zapier so you’ll be able to pass the contact information where it needs to go. They have direct integrations with WordPress and Wix. Other integrations are done through inserting a code snippet. Poptin – simple popups to generate more leads – is lead capture software that focuses on making different types of popups for lead generation. They market themselves as a solution to reduce ecommerce shopping cart abandonment as well as a way to grow your email list. With each of the popups, you can choose between exit intent, scroll percentage, timed display, and after clicking a link. The reporting is simple but gives you the information you need to make informed decisions which includes views, contacts, and conversion rates of each form. They integrate with the most popular email marketing services, so your leads can be followed up as soon as the data is pushed to your ESP. An interesting feature of Poptin is built-in AI. If you’re not sure about your targeting you can turn on the AI and it’ll test different targeting options until they land on the highest converting one for your website. Leadquizzes – an online quiz maker – is lead generation software that uses self-made quizzes to generate leads and segment your users. There is a large library of quiz templates. You can start with a template and customize to fit your needs. You can send the leads to your email marketing provider using native integrations or Zapier. With the Zapier integration, you can apply specific tags to users based on how they answered questions. The drawback is that you need a premium Zapier subscription to make that work properly. Leadquizzes has basic and advanced reporting tied to the different pricing tiers. The same is true for customization options, you only get the full software when you upgrade to a higher tier. They use a freemium model with no credit card. Paid plans start at $22/m. Interact is another lead capture tool that focuses on making interactive quizzes. They’ve been around for a number of years and it shows in the maturity of the app. There are hundreds of templates, making it easy to start with a quiz that’ll be relevant to your audience. Their customization options give you the ability to change most of the elements of your quiz so it looks and feels like your brand. You can change the background colors, start image, fonts, add your logo, and more. In addition to the standard quiz features, you’re able to add logic branching to give a better quiz experience. Interact can be tried as freemium. The paid plans start at $29/m. Wisepops is list building software, to create intelligent website popups. They’ve been around for roughly five years and built a solid product. They have a large ecosystem of integrations and have most of the popups you’d expect from a tool that’s been on the market for the last few years. Wisepops focusses on Ecommerce but can also be effective for gathering leads for any type of brand. The simple interface and targeting options make this a good choice if you’re looking for just popups. But it’s much pricier than other comparable leadgen tools. It comes with a 14 day free trial – then plans start at $49/m. Privy started as a tool to help brick and mortar stores track online conversions. When they couldn’t find traction, they pivoted to online lead capture software with an emphasis on helping Ecommerce stores grow their email list. They’re one of the few lead capture solutions with a true drag-and-drop editor. Privy also provides simple landing pages to help you capture more leads. Personally, I’d use a dedicated landing page builder. The landing pages are quite basic, but can get the job done if you don’t have any other option. They use a freemium pricing model. Paid plans start at $24/m. Sumo is a lead capture tool that’s bundled with (social) share buttons and is billed as the easiest way to turn visitors into Ecommerce customers. Multiple targeting options make it possible to get granular with who sees your messages. For example, you can set popups to only appear for certain referrers or people who’ve visited a certain number of pages. Reporting gives a quick snapshot of how you forms are doing. By default, you can see last weeks’ data. With premium plans, you can unlock monthly, lifetime, and custom date ranges. Sumo offers a fairly standard product that works on most websites. They operate on a freemium model with paid plans starting at $29/m. Optimonk is an interesting onsite targeting and lead capture platform. They started in 2014 with just exit intent forms, now they have a more powerful tool. Reduce cart abandonment by showing exit intent popups and offers related to items inside the cart. Once you’re comfortable with their drag and drop editor, customization is simple and straightforward. Targeting gives you the ability to send the right messages to people based on their behavior, referral source, and many other factors. Optimonk has a 14-day free trial and paid plans start at $29/m. Outgrow takes a different approach to lead capture. Where most of the email list building tools in this review focus mostly on popups, they don’t have popups at all. Instead, they use quizzes, polls, assessments, recommendations, and calculators to help their customers generate leads. I like the polls and calculators most. If you have a business that’s highly customizable – like app or web development – this is a way to segment and qualify leads before you start your follow up. They have a straightforward builder that lets you build the interactive content quickly. Outgrow also has a large integration ecosystem so you can send your lead data to your other pieces of MarTech like CRM or Marketing automation tools. A major challenge with Outgrow is the way they limit their paid plans. In the first tier, you only have access to quizzes and almost no support. According to reviewers, a lot of their templates are for sale instead of freely available to customers. They offer a 7-day free trial. First tier paid plans start at $22/m for quizzes only. Optinmonster is a well-known email capture tool that focuses on providing popups for SMBs. They market themselves as an Ecommerce solution as well as a way to grow your email list. This monster comes with a wide range of targeting features out of the box. A/B testing and display options are there to help you capture more leads. The lead capture form customization allows you to get the right look and feel for your forms. This was the first software I used that allowed to create popups that opened based on clicking a link. At the time, that was a game changer. They don’t offer a free trial; instead, they have a 14-day money back guarantee. Prices start at $229/year (no monthly option). Justuno is an email lead capture platform or “conversion rate optimisation suite”. You can use them to turn your current website visitors in to registered subscribers and leads. But also to serve banner promotions, Countdown timers and are especially good in using ecommerce data to segment and show the right promotions. Their emphasis is on popups and collecting the data to send better messages across your website. With that end in mind, you can A/B test variations of your popups and offers. They have a limited range of popup types when compared to their competitors. Though they only have a few popup types, they have pr-ebuilt templates and direct integrations with Ecommerce platforms such as Shopify. They take the data from the Ecommerce integration and generate popups to nudge your (known) visitor to action. You can target promotions to users based on their activity and even current cart value. It’s free up to 5.000 site visitors a month, paid plans start at $19/m. Listagram is a specialized lead capture tool. What makes it specialized? It only offers one kind of popup – spin to win gamification. An interesting feature of Listagram is the ability to monitor your conversion rates across different devices. The only issue I find with this lead capture software is the fact that they only have one type of popup. It’s the best lead capture tool for what it does but the focus on just spin to win is too narrow for my taste. What if I don’t want to give discounts to my subscribers or don’t have a prize to offer? Will that prevent me from using this tool? In addition, there’s a real chance to attract lower quality customers that’re only interested in bargains. It’s useful in combination with another list building tool for general lead capture. Listagram has a free tier for less than 5000 views a month. Paid plans start at $29/m. Sleeknote says they’re the next generation in lead generation software because, instead of popups, they use smart onsite messages. It sounds like marketing speak to me. The built-in customization allows you to match the forms look and feel with the rest of your website. Sleeknote does more than capture email addresses. Their platform comes with a digital assistant that can help shoppers find what they’re looking for, give product recommendations, and do promotional campaigns. They have integrations with most email service providers and Ecommerce/CMS so you can route your data to your own tools for follow-up. It starts with a 7-day free trial then paid plans start at €62 a month. Email prospecting software lets you take a more proactive approach to lead generation. Instead of waiting for your ideal customer to come to you, you find their contact information and reach out to them to close deals. It can speed up your sales process considerably. The downside is you’re limited to what a single person can do (unless you automate it further). One of the most important things to look for in email prospecting software is whether or not the information they bring back is accurate. Right after that is how do they source and verify the email addresses that they find? Some software scours the entire web while other software searches specific places like linkedIn. AeroLeads – get business emails, phone numbers, and B2B data – is a focused email prospecting tool used to find the emails of specific people or the phone number of their business. They have a chrome extension to prospect while you’re on a company websites. After installing the chrome extension, you can navigate to sites like LinkedIn, Crunchbase, and AngelList to find leads in real time. In addition to finding contact information, AeroLeads lets you verify the emails you’ve gotten from their service or other places to improve your chances of landing in the right inbox. AeroLeads is unique in that it also has a “done-for-you” email prospecting service. All you need to do is submit details of your ideal customer and they’ll get the contact information for you. Pricing starts at $49/m for the software and $799 for their done-for-you service. RocketReach is an email lookup tool that distills the massive amount of information available in the public domain to bring back relevant contact information. You can get the email (personal or work), phone number, and social media accounts of hundreds of millions of people. If your prospect isn’t there then they may not have an email address. There’s a chrome extension that allows lets you collate contact information directly from profile pages or search results related to your prospect. When using the web application, you can filter based on multiple criteria such as location, company, and job title. RocketReach has a limited free plan while paid plans start at $39/m for 170 lookups. LeadGibbon is bold. Right on their homepage, they call out one of their competitors (hunter – we’ll discuss them later) and say they’re better. Anyways, it’s LinkedIn prospecting software. Install their Chrome extension to get started. When inside of LinkedIn Sales Navigator (LSN), you’re able to click the Gibbon button that appears to find email addresses. It checks possible emails against their company domain until you have the right one. You can also save emails directly to Google sheet. It’s a standard tool that will do its job but don’t expect anything spectacular from it. They start with a seven day trial that gives you up to 100 email lookups. Paid plans start at $99/user/m for 200 emails. This is was an early player in the lead prospecting space. Voila Norbert – a tool to find anyones email address – performs a few functions in addition to email lookup. You can verify the generated emails and enrich contact data. Most of these functions are performed automatically when it finds an email address. A feature I like is the confidence rating they attach to the emails generated. If he’s not sure of the deliverability then he’ll let you know ahead of time. The tool supports .csv upload for bulk lookup and has a Chrome extension that lets you search for emails on the go. They start with a free plan with fifty free verified contacts (if they can’t find the contact then it doesn’t count against your quota). Monthly plans start at $39/m or $.10 per lead if you chose to pay as you go. Hunter is a popular email lookup tool and one of the only ones with a Firefox extension. 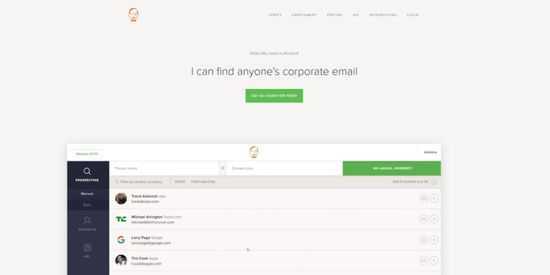 It’s possible to find almost anyones email address in seconds. 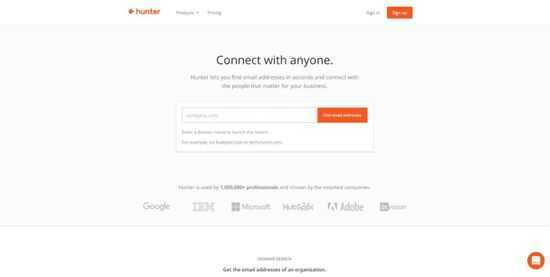 Hunter scours public sources to find the email address of your prospects. Whenever they locate an email address, they let you know where they sourced it. The hunter search function is a bit different because they bring back all the email addresses associated with a domain. That could be a good thing or a bad thing depending on your goals and the information you have about potential prospects. On top of the email lookup features, you can also test the deliverability of the email addresses you discover. They have a free plan that gives you 100 free lookups a month. Paid plans start at $39/m. Anymail finder– the email finder that makes sure your emails don’t bounce – is a bit different from other email lookup tools because they use a rollover credit system. If you don’t use all of your searches to find verified emails every month then they’ll roll over to the next month. This is handy if you are prospecting more during certain periods and less during others. Their approach to email verification is that they test it directly against the domain server. Like Voila Norbert, they only charge you for verified email addresses instead of the number of lookups. It supports bulk upload and an API accessible by their customers. Unlike other tools, they don’t have a Chrome extension. The first twenty emails are free then paid plans start at $49/m. This email prospecting software performs all the major tasks associated with lead prospecting. SellHack has a twelve step verification process which includes using multiple data providers to ensure you get the right contact information. In addition to finding the contact information of your prospects, Sellhack allows you to set reminders and follow up via multiple channels. They integrate directly with your email client such as gmail or outlook, so you can send outreach and follow up emails to prospects from the platform. Finally, they have a bulk upload and verification feature. Give them incomplete data such as a name and company then get contact information back. The free plan comes with 10 email credits and paid plans start at $19/m for 150 credits. LeadFuze – email prospecting automation – has a different approach to email address prospecting. Instead of going to LinkedIn or Crunchbase to find data, you do it from their dashboard. They claim to use AI to improve your list building efforts, verify emails, and prevent duplicate entries. There are integrations with multiple applications and tools to send outreach and sales follow up emails. This is one of the best email prospecting tools in this review and will go a long way towards streamlining your prospecting. Plans start at $97/m for 500 credits a month. Email outreach is the next step after gathering an email list through email prospecting tools. They make it easy to send and follow up with prospects over time. And help to increase your open, reply, and sales conversion rates. An email outreach tool is only as good as the data you feed it (which you for instance got from prospecting tools) and the email sequences you use. An online email follow up tool is not a replacement for the human touch. Here are the best email outreach and follow up tools we reviewed. When evaluating email outreach software, there are a few things to look out for. How do they handle merge tags and what exactly can be personalized in each email. Some arequite limited while others go as far as letting you A/B test your email copy. How many emails can you send in a day or at once? The way some of these platforms work, they’re limited by the integrations you set up. For example, if you send email through Gmail then you’re limited to you can send 150 emails through Gmail a day when you’re logged in through a remote client. This won’t be a problem if you don’t send many emails a day. If you’re a high volume sender it’s something you should take into consideration. What information is available in the reports. Do they get granular or is it just a high level overview? Cn you see open, clicks, and replies alone? can you see how your campaign is performing over time? Of course, the amount of information you need depends on the goals of your campaigns, but it’s important to be aware of the limitations. Lemlist is email outreach software that makes it simple to send great emails to your prospects – they describe it as emails that get replies. It comes with multiple pre-built templates and follow up sequences. Lemlist also gives you the ability to A/B test your subject lines and email content until you find the best variations. You can personalize emails by merging the name, company information, and other custom fields. What sets Lemlist apart is the ability to add personalized images to your emails. You can add a logo, website, headshot, or anything you can think of to personalize the emails. The software also has built-in reporting to track open rates, clicks, replies, and bounces. It starts with a 14-day trial then $19/m. Mailshake is email follow up software for gmail. It has gone through multiple iterations before arriving at what we see today. Mailshake comes built-in with multiple templates that work for sales, guest blogging outreach, and customer engagement. They have a nifty feature that shows real time suggestions such as words to delete, length of content, and whether or not your email is likely to get a response. If you’re not sure of what you’re sending (or just need a fresh perspective), you can request a free manual review of your emails. In addition, you’re able to control how and when your messages go out, add merge fields, and schedule automatic follow-ups based on recipient actions. Of course, there are reporting features so you can optimize your campaigns over time. Be aware that it only works with Gmail. Plans start at $29/m. There’s no free trial but there is a 30-day money back guarantee. Reply – a sales acceleration platform – bills itself as an all-in-one solution for inbound sales, outbound sales, account based sales, recruiting, business development and more. Everything sales actually starts after the initial outreach. Reply allows you to automatically follow up with prospects, track reply rates, click throughs, and more. There are email templates categorized by their use cases. One of the features that sets Reply apart is their integrations to streamline your workflow. Most other follow up tools are self contained or only have one or two integrations. Reply has many more to for instance connect with your CRM, Slack or sales pipeline software. Reply employs “AI” to sort contacts into different buckets and vet your emails to increase deliverability and reply rates. After a fourteen day trial, prices start at $40/m. Rebump is a simple email follow up tool for gmail. They stripped away a lot of the features other email outreach platforms have. to focus on their core offering. Rebump integrates directly with Gmail. After sending an email, click the checkbox to initiate follow up messages – they take care of the rest. Inside Rebump, you can monitor how many “bumps” you’ve sent as well as set the frequency of the bumps. This is truly a bare bones app. Don’t expect any magic. That being said, it does its job well. They have a thirty day free trial and paid plans start at $5/m. SalesHandy positions itself as a suite of email tools used to make the most of your email outreach. Instead of switching between multiple specialized tools, you can do most of what you need from one backend. You’re able to send emails, follow up, track opens, and use templates. In addition to tracking open, click, and replies, you also get insights into how your prospects are interacting with attachments (one of the few tools that does this). They round out their feature set with mail merge and integrations with all the major mail clients. They have a free plan with paid options starting at $7/user/m. This handy outbound email automation software prides itself on a clean and simple interface that gets out of your way and allows you to work. With PersistIQ you can create campaigns and add multiple steps and recipients. When the campaign is live, you’ll be able to track the key metrics like opened, clicked, replied, and opted out. You can also drill down further to look at metrics of individual contacts. PersistIQ has pre-built email templates or you can make and save your own to speed up your workflow. They also have hundreds of integrations via Zapier and dedicated ones like Salesforce and ProsperWorks. Of course, there are mail merge features but these are a bit smarter, because it makes sure the merge variables are available or it doesn’t send. Sendbloom is outbound email software that which speeds up the direct sales process by offering a lot of interconnected features. It connects your sales efforts across multiple touchpoints like calls and social channels. It integrates directly with Salesforce and Gmail to help you launch personalized campaigns. Use templates or build your sequences from scratch to maximize your open, reply, and click through rates. Sendbloom has a segmenting feature which allows you to get VERY granular with your messaging. As you’d expect, they have reporting features to get a view of entire campaigns or individual mailings so you can stay on top of your lead generation. But Sendbloom is a lot of functionality if all you want to do is send emails and follow ups. Pricing and demos on request only. Mixmax is versatile email outreach software that’s effective from direct sales to link building. They have the standard features like reporting, follow ups, and email outreach campaigns. It integrates directly with everyone’s favorite email client – Gmail. On top of that, you’re able to insert calendars directly into your emails to cut down on unnecessary back and forth. The defining features of Mixmax include polls, surveys, cloud storage integration, undo send (life saver), and custom branding. With all the added features you can do everything from recruitment to link building. I’ll be the first to admit, it does a lot and you’ll need to be a power user to get the most out of it. They have a free plan for 100 emails a month and paid plans start at $9/user/month. Email marketing automation tools come in many flavors. Some are full marketing automation tools and CRMs while other just focus on sending email really well. We’ll go through some of the best email marketing automation software on the market to help you nurture the leads you generate and close sales. Let’s not kid ourselves, most of your newsletters and automations are going to be emails. So it is very important that these render well and the email creation process is easy and allows you to do automations but also ad-hoc promotions and newsletters. What information do they give you about your campaigns? Is it simply opens, clicks and bounces or can you set up goals and split tests to get granular with the information you have access to? This is where email marketing automation software shines. When you can monitor email, website, and purchase behavior to trigger automations, you can send better messages and increase your revenue. Finally, do they play nice with all your other tools. It doesn’t matter if your email marketing automation tool does everything you need when it doesn’t integrate with the other tools you use. Make sure the tool you use integrates with your current marketing stack. ActiveCampaign was one of the first email marketing tools to roll out marketing automation to all of its customers. I’ve personally used it for all my projects over the last few years. They’re able to unify multiple touch points (purchases, website behavior, and email engagement) to create a full picture of your contacts and improve your marketing automation results. They have a visual automation workflow that lets you schedule messages to go out to your new leads or current customers. The power in ActiveCampaign comes from the ability to add tags, branch automations based on visitor behavior, score contacts. ActiveCampaign has a built-in CRM. They also have other important features like split testing and segmentation for nurturing your leads. You can send specific messages to one group of people then test that message against multiple variations also in your automations. They have a free trial. Paid plans start at $9/month. GetResponse is email marketing automation software mixed with a hint of growth hacking tool. They’re a unified platform for small business marketing which include newsletter blasts and drip campaigns. They focused on making a strong landing page builder as well as a webinar tool that integrates directly with the rest of the platform. You can use their marketing automation features to build campaigns that react to custom variables and your lead’s behavior in real time. The end result is a constantly evolving campaign that closes more deals. Unlike other platforms, you’re unable to use the best features of the marketing automation platform until you upgrade to higher plans. Pricing starts at $15/m for up to 1,000 contacts. 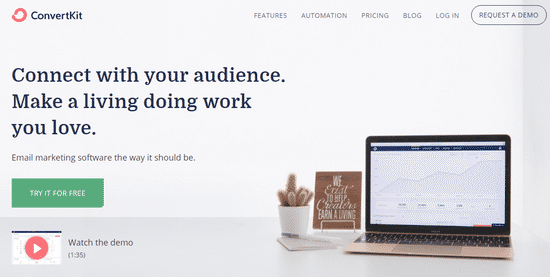 Convertkit positions itself as the go-to email marketing and automation tool for creators and bloggers. You can tag and segment subscribers. Through these tags, you can send targeted messages to the right people. ConvertKit comes with the ability to build automations based on an “if this then that” format which allows you to react to subscriber behavior. I like this approach because it makes everything so much easier to understand which can be a challenge with marketing automation. Integrations make it possible to pull in data from many sources, especially in the membership and training area (because creators / bloggers focus). They have a fourteen day free trial and paid plans start at $29/m. Aweber is a simple email marketing tool, their drag and drop campaign builder is easy to use which is always a plus. Key features include tagging, newsletters, drag and drop editor, and split testing. You can also segment subscribers based on criteria important to you. Their marketing automation features are basic but can still get the job done, if you don’t have that many wishes and keep your automated marketing campaigns simple. Use the mobile app to monitor the health of your campaigns. The reporting features will allow you to understand what’s working and what’s not. Aweber has a thirty day free trial and paid plans start at $19/m. This email marketing automation tool allows you to build visual automation workflows that react to what your leads do (or don’t do). It is designed for small and medium businesses. Automizy comes with a drag and drop email editor, multiple templates, and out of the box personalization options. Similar to other automation tools, you’re able to segment your messages to go out based on multiple factors such as list, actions, and custom variables with what they call “live filtering”, meaning you can save any filter and selection on your leads and customers to use them later. All these options allow you to create automations that feel personal to your leads. One feature that’s not present yet is website behavioral targeting based on pages viewed. Right now, Automizy is a bit basic for the true automation enthusiast, but probably a good match for SMB with a bit of automation aspirations. It starts at $9/m with a 14-day trial. Elastic email is an email marketing platform designed with simplicity in mind. With the software you can segment and personalize your emails using merge tags, dynamic content replacement, and conditional subject lines. In addition to that, you can send out smart drip campaigns based on the segment you’ve added the subscriber to. They’re one of the few email marketing services which allow you to perform testing on almost any aspect of the email (layouts, subject lines, content, etc). They have a built in survey feature that lets you ask your subscribers questions to better personalize their experience. A strong point of Elastic Email is that they offer 24/7 Customer Support, even to free accounts. That is especially helpful when you are just starting with Email Marketing. Pricing starts at $9/m for up to 2,500 contacts. Mailchimp rebranded to focus on being a platform for all your marketing needs. To achieve that aim, can create Facebook ads, Instagram ads, and Google remarketing ads in addition to landing pages. But they are still the most popular email marketing software, first. They have features that enhance your email marketing. Needless to say, the UI can get complicated. On the email marketing automation side, you’re able to access insightful stats reports, add personalization, segment, split test and create automations that nurture and sell to your leads. A neat feature I’ve only seen one other email marketing automation platform do is send physical postcards. They have deep integrations with key Ecommerce platforms such as Shopify which lets you track the ROI of your campaigns from inside the app itself. Mailchimp is free for the first 2,000 email subscribers with paid plans starting at $10/m. Drip is big on integrating every touchpoint your leads and customers have with your brand. It comes with tracking features which give you deep insights and allow you to automatically add tags, segment, and trigger events. On the email marketing side, you’re able to send drip campaigns (hence the name), build automated workflows, and personalize messages at scale. They also embrace the trend in multichannel by allowing you to create Facebook ads, postcards, and personalized website pages. See our full review of drip marketing software here. It starts at $49/m after a 14-day free trial. Moosend is an easy to use and effective email marketing and email drip software. They have a straightforward workflow so it is very easy to get started without any training. With Moosend you can create beautiful newsletters. The email editor is something I really like here. It is a true drag and drop editor and has a autosave and history feature, which we all know can be a life saver! Segment your audience, and build opt-in forms to capture leads. The capture forms are less sophisticated than the dedicated lead capture tools on this list, but will get the job done. With automation, you can create pretty advanced email drip campaigns. Start when people subscribe with a welcome email then evolve the campaign based on what they click on, open, or actions they take on your website. There are multiple pre-made email drip campaigns called “recipes” to get you started quickly. They have integrations with platforms like Woocommerce and Bigcommerce so you can pull cart data right into Moosend and trigger automated email campaigns. It’s free for up to 1,000 contacts with paid plans starting at $10/m. Live chat software made its debut a while back but only recently got popular with solutions like Drift and Intercom leading the charge. They’re a type of lead generation software you embed on your website which allows you to engage with customers. Live chat tools are great for lead generation and double as a customer support solution. You can’t always be there to chat with people in real time. Availability times allow you to set expectations with your visitors and encourage them to help themselves. Bots help you prequalify visitors so you get the best leads. Can you route visitor queries to the right help documents when you’re not available or set up meetings when you’re otherwise indisposed. Of course, the functionality of the bot will depend your goals. Drift champions conversational marketing with their offering. Instead of multiple steps before you can qualify a prospect – which can take days – their bot does it rapidly. You get a hot lead that’s ready to talk to a real person – and possibly buy. If not, you can route them to your email marketing platform or CRM and continue to follow up. I think that is marketing automation at its finest. The key aspect of drift is the use of bots who follow a script predetermined by you (or a template you can adapt) to qualify leads. Once qualified, you’re alerted and can jump into the conversation or book a meeting for later. Drift also gives you information about anonymous visitors, provides a help center so your bot can answer common questions, and integrates basic email marketing functions. There’s a limited free plan with paid plans starting at $50/m. Pure Chat – live chat software for businesses – divided into two distinct functions. One is for support and the other is a chatbot geared towards lead generation. You’re able to set up a few automated replies to qualify and capture leads. Pure chat has a simple interface that allows you to customize the colors, availability times, welcome messages, and more. It also has a native Zapier integration so you can send your leads to your CRM or other marketing database. It’s a great free option but I’m not convinced about the premium price point, pro features cost $79/m. HelpCrunch is an intelligent customer communication platform that allows you to send emails, receive inbound support emails, and install a live chat widget on your website. The HelpCrunch chat widget combines messages across multiple touchpoints. If someone sent you an email then opened a chat conversation with the same email everything is unified. Of course, there’s personalization. You can automatically add leads to email marketing campaigns to increase engagement and conversions. It also has the ability to setup custom messages based on specific variables like time on page, referrer, browser language, etc. The only thing missing here is a knowledge base which they’re working on adding later in the year. They have a free plan with paid plans starting at $12/user/m. Freshchat by Freshworks is one of the many growth hackingtools created by freshworks. It’s a versatile live chat app that can be used for sales, marketing, and customer success. Even though it’s a live chat tool, its effectiveness lies in the ability to create custom campaigns with bots. Based on user behavior (downloads, pages visited, etc.) the bot will send a custom message, qualify your visitor, capture contact information and upload them into your CRM or ESP. When a lead reengages with you, their information is automatically populated so you have the right context. The chat widget is customizable so you can make it reflect your brand. They have a limited free plan with paid plans starting at $19/user/month. Olark is an old staple when it comes to live chat software. It doubles as a live chat tool for sales and customer support. First off, they have a lot of customization options to match the chat widget to your brand. Built-in automation workflows allow you to tailor your messages to visitor behavior (location, referrer, or browsing behavior), qualify leads, and ensure you close more sales. They also provide reporting metrics to optimize your messaging over time which has the positive effect of potentially delivering better leads. They integrate with other tools such as Google analytics, Groove, and Front. After a 14-day trial, plans start at $17/user/month. Tawk.to is a fully featured live chat app to engage with visitors and capture leads from your website. You can monitor who’s on your website in real time, customize the widget to match your brand, and use the mobile app to answer messages on the go. The app integrates with most CMS and you can also set up automation triggers for your chat widget. Tawk.to is truly unique because it’s a 100% free chat app. They make money through services and add-ons such as providing live chat agents and removing branding. Website Alive is a contender for the live chat software throne. Their solution is called Website Alive.com. It has the major features you’d expect from a live chat app such as customization, automated triggers, and routing rules. The reporting gives you the metrics you need to optimize your live chat lead generation efforts without becoming a burden. A unique feature is the ability to distribute links to your chat so people can click (social media or email) and engage directly with you or an agent. Pricing for AliveChat starts at $30/user/month. Landing pages are the staple of any lead generation campaign. They’re specific pages focused on one thing – conversions. That may be a sale or a lead. Landing pages have minimal navigation, strong calls to action, and focused copy. You can send traffic from any source like SEA, facebook campaign or use them in tandem with your site as download leadgen pages. Specific landing page builders are made to deal with this type of conversion pages and usually have smart functions to make A/B testing, launching and building landing pages easier. A landing page builder is usually an intermediate tool. It helps you move closer to the ultimate goal of converting visitors to customers. with that goal in mind, it needs to integrate with many other platforms to let you send nurturing emails, collect payments, etc. You never know if you’ve got the best version of your page until you test it. Split testing should be readily available on all the plans instead of having to upgrade to a higher tier to access it. I’ve had my fair share of landing page tools that didn’t give accurate reports. The tool would say I had x amount of visitors and conversions while my email marketing service told me differently. Needless to say, I dumped it. With the wrong data, you can’t make the right choices. Instapage has gone through a transformation over the last few years. They went from one of the many landing page builders out there to a landing page solution just for teams and agencies. They have dedicated support for permissions, multiple users, collaboration, and notes on pages being built in the platform. Their builder is one of the most intuitive I’ve ever used. They have heatmap reporting, allow for dynamic text replacement, and split testing. Desktop and mobile editing is separated so you can get perfect versions for all your visitors. One of my favorite features is global blocks. Instead of having to go back and edit each page individually, global blocks makes it possible to do it at once. It’s a great tool but it’s much more expensive than any other one on the market. That’s because they target agencies and the enterprise. The enterprise market has a different price point. After a 14-day trial, plans start at $129/m. Leadpages is one of the most popular landing page tools for lead generation on the market. They’ve evolved from a stiff builder with a lot of templates to a more flexible solution for marketing and lead generation. Templates are very important for landing page building software. Leadpages comes with over a hundred free landing page templates. The template are categorized, so high converting pages show up first. That is especially nice, you will have a head start when building a landing page. They sport a wide range of integrations, and automatic lead magnet delivery. An interesting feature for lead generation is the integration with Facebook ads and placement of Facebook pixel. You can make, launch, and optimize Facebook ad campaigns from the backend. The reporting is simple, including campaign ROI and easy to understand so you can derive insights that move your business forward. Leadpages comes with a 14-day trial then starts at $37/m. 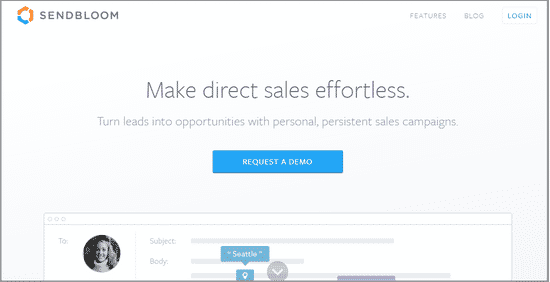 Unbounce has expanded their product from a landing page builder to include floating bars and popups. You could call it one of the most powerful landing page builders available to small businesses. The landing page software has a drag and drop visual editor that lets you control every element on your pages. You can start from scratch or choose from a their collection of templates built based on high converting pages. A/B testing and dynamic text replacement come standard. Their reporting features are clear and help you uncover multiple points of improvement. Unbounce has one of the largest integration ecosystems around (from being in business for quite some time), because after generating the leads, you will want to send them to your own marketing and CRM tools and follow up. They have a 30-day trial then pricing starts at $99/month. Lander is a solid landing page builder. They say their mission is to help you build great pages that convert. To achieve that mission, Lander comes with over a hundred templates out of the box. The main features of Lander include a straightforward editor, A/B testing, and integration with your Facebook page as an extra tab. You’re able to implement dynamic text replacement to improve your PPC campaigns. Two of the features I like most with Lander are the autofill forms and the built in welcome email (great for lead magnet delivery). Their reports give you the information you need. All the pages you create are automatically mobile optimized. Lander integrates with the most popular email marketing services. Pricing starts at $49/m after a 14-day free trial. Landigi is a landing page tool to create conversion focused squeeze pages and has a strong focus on giving you the ability to make pages that generate leads. The landing drag and drop editor lets you design mobile and desktop landing pages separately – so you can make them exactly like you want . There are over 200 templates to choose from, and it doesn’t take long before you have a beautiful landing page created for your business. Landingi also comes with a built-in image and icon library to further speed up page creation. Split testing, simple reports, and multiple integrations make Landingi a solid choice for a pure landing page builder. Prices start at $39/m after a 14-day trial. Pagewiz is a standard landing page builder that lets you create and publish multiple pages without hassle. It’s focus is on optimizing pages to get a higher return on your paid marketing campaign. It’s packed with features such as a true drag and drop landing page editor. You can use the Google fonts from their interface. Mobile optimized design for your landing pages with over a hundred templates and native integrations with video players like YouTube for video landing pages. Pagewiz plays nice with most CRM and email marketing tools to follow up with your leads after they sign up. Alternatively, use a webhook or the Zapier integration. You get to A/B test your pages and access reporting that help you optimize your campaigns. Pagewiz also has an API you can use to extend the functionality of your own (saas) products (or makes something unique for your customers). It comes with a 30 day trial then starts at $29/m. Dragdropr is landing page software that lets marketers create any type of page. That includes blog posts and Ecommerce product pages. You could also call it a website builder. Because of that, they have ready integrations with all of the most popular content management systems. They have a drag and drop builder that works on the principle of content blocks. The editor takes a bit of getting used to, because some items are hidden in the menu. It comes with automatic responsiveness for mobile. A chrome extension so you can make changes directly from the front end of your website. I thought that was pretty neat because it’s always a time waster to log into a tool to make one or two tweaks to a page. There’s a 14-day trial then it costs $19/m. Landen is the final page builder on our list but it brings a lot to the table. Landen takes a different approach to creating landing pages. Instead of giving you templates and letting you loose on the world, they ask a series of questions. Once you answer them, Landen will generate a landing page for you. With that as a starting point, you can edit the fonts, colors, images and content. The editor is not inline, meaning that you see the texts left and the resulting page to the right. You can host videos, lead capture forms, and access reports that give you the most important information you need. When you need a series of pages quickly then this will help you create a beautiful consistent design. If, instead, you want more control of your pages then this may not be the best option. Your first page is free then plans start at $15/m. Scheduling software has one purpose – to plan meetings and calls with the leads you’ve generated without the back and forth. The other lead generation tools in this article wouldn’t as be effective if you couldn’t take your relationships to the next level. With meeting scheduling apps, it’s important to make sure they integrate with your current calendar. apart from that, as long as it books meetings then you’re good to go. Doodle is a stripped down scheduling app that’s laser focused on its main task – scheduling more meetings. Integrate it with the calendar you use and set it up to show your free times. After that, create a description of the meeting or event, send it to your participants, let them fill in availability, and choose the times that work best for you. That’s it. You should be able to set up meetings pretty quickly. They have a mobile app which allows you to set meetings straight from your phone. It has a free plan with paid options starting at €8/m. Calendly is full featured meeting scheduler app for individuals and teams. You’re able to integrate with your calendar, set up a custom page and availability, and then send out your link to leads. Your participants choose the best time for them (localized) and everyone is good to go. Conversely, you can use it to capture leads by sharing the link on social media and your website. Calendly has extra features such as capping the number of meetings in a day, buffers between meetings, and minimum notification times (this is especially useful if you have a public calendar anyone can access). It’s free to use with paid plans starting at $10/user/m. As the name suggests, Pick allows your leads to pick the best time for them based on your availability. After you sign up, integrate your calendars (optional), set your availability, and grab your custom link. Once you share the Pick meeting link, they can select the times that work best for them. If Pick has access to both calendars, it helps surface times that are free for everyone to cut down on confusion and the time spent looking for available spots. NeedtoMeet is a scheduling tool that can save you hours every week. Once you setup your account there are only a few steps to follow. Create a description of the event and set your availability, grab your custom link, and send it out to participants. They select a time that works and you’re all set. You can edit meetings in your dashboard, view comments from your attendees, and receive confirmation notifications. There’s a free plan with paid options starting at $12/user/year. Setmore has all the features you need in a meeting app and much more. For many people, it has too more features than needed. Let’s take a look. You can, of course, sign up and send out a unique link to set appointments. They have email alerts and reminders for you and your appointments.The difference between Setmore and most other scheduling tools is their live call answering service. You can also take payments via your booking forms. In addition to integrating with your calendar, it works with your content management system, social profiles, Slack, Instagram (I thought that was a bit much but It must be important to some of the customers) and more. They have a free tier with paid plans starting at $25/m. Sign up for Appointlet and get started by customizing your booking page. . Once done and synchronized with your calendar, you can embed it on your website or share the direct link. Your prospects can choose the best times to schedule for instance a demo or first lead intake. Appointlet has a Zapier integration which allows you to cut down on manual entry and push the data to your CRM, payment or other applications. You can also collect payments through a Stripe integration. They have a free tier and the paid option starts at $10/user/m. With You Can Book Me – a team meeting scheduling app – streamlines the entire process for everyone involved. Integrate your calendar, set up your booking page, and share with your prospects. Your leads choose times that work for them and you. It sends out multiple reminders on your behalf, allows you to take payments through a Stripe connection, and integrates with Zapier so you can update/add lead data to your CRM. You can also choose the length of meetings, add buffers, and send automated follow up emails after the meeting. They have a free account and their paid plan costs $10/m/calendar. If you don’t understand your users then all the lead generation tools in the world won’t help you (very much). Because of irrelevant messages, because of wrong segmentation, because of… lack of research and personalisation. How do you figure it out? You observe and ask questions. In a lead generation context, you can use surveys (paired with an incentive) so people leave their contact information. You get deeper insights and they get a goodie. You can also use survey opt-in forms. Before you capture leads, ask them a few relevant questions that will help you segment them into different groups. This can only be done once you understand who your market is – not before. Otherwise, you’ll be asking the wrong questions. The customer research and survey tools in this section will help you understand your audience so you can generate more leads and send targeted messages. Qualaroo is a survey tool that combines features to get actionable user feedback. Instead of just asking questions about their experience, you’re able to set up workflows that react to user behavior. Show different questions or take different actions based on the user’s geography, referral source, or even on site actions. They also integrate with IBM Watson to perform sentiment analysis and get deeper insights into large amounts of data (I think that is a really unique feature). Qualaroo has an API available to integrate with your application and use the data you generate to react in real time. The platform has a 14-day trial then plans start at $99/m. Typeform is popular survey software that looks good. The survey software works well on almost any platform and device. The Typeform way is to create a survey experience your customers and users could love to increase your response and completion rates. It has a straightforward builder with multiple answer types such as long answer, multiple choice, and yes/no. You can customize almost any element of the form and, with a bit of tweaking, it’s possible to create quizzes. They have a lot of integrations with various tools so you can slice and dice your data..
Typeform has a free tier with paid plans starting at $35/m. SurveyMonkey is one of the most popular survey platforms on the internet. With it, you’re able to get feedback and capture the voice of your customers in different contexts. They have a proprietary feature called SurveyMonkey Genius that predicts how well your survey will perform based on multiple data points. From there, you can tweak it so it get the results you’re looking for – more responses and quality answers. You can make basic customizations like changing the color palette and adding your logo. The analysis features give you the right insights to take action on your data. They have many templates so getting up to speed is a matter of choosing what works for you and tweaking it to your needs. There is a free tier with paid options starting at $35/m. Crazy Egg may not be the first thing that comes to your mind when you think of a tool for customer research – bear with me. When people are on your website, you have little idea of what they’re doing, the things they click on, and what they ignore. Crazy Egg helps marketers find out with heatmaps, visitor recordings, and click activity. Understand how far down your pages people scroll and whether or not they get to the most important information. Are they trying to click images that aren’t linked to anything? A/B test it with Crazy Egg to see if you can improve conversions. This passive method of customer research can work wonders when you pair it with visitor feedback. Paid plans start at $29/m and come with a 30-day trial. Survicate is a survey tool that lends itself to many applications. You can, for instance, use it for product development, customer feedback and measuring satisfaction, website optimization, and more. It has an easy-to-use builder and many templates to choose from which are based on specific use cases. Skip logic, advanced targeting, and lead scoring are included in their paid plans and gives you more control of the experience your end users have. In addition to the delivery options, customization is well thought out, it allows you to add your own CSS. The reporting is more detailed than most other platforms. For example, they have a dedicated NPS survey which helps you figure out your NPS score (which is useless on its own BTW). With it, you can see how your NPS is changing over time and understand whether or not you’re meeting your customers expectations. The have a free tier with paid plans starting at $159/m. Survey Anyplace is a survey maker that combines standard survey features with interactive elements. Making it an engaging experience. There are multiple question types such as long answer, image choice, yes/no, smiley ratings, etc. When users take the survey, they can be incentivized with a prize delivered in an interactive format. Like a scratch card or slot machine to deliver the prize. Personalized experience can go further with assessment-features such as Variable Scores per answer, personalized outcomes, and an Animated Gauge to indicate results. You can use an online self assessment for lead generation as well. Marketers have control of the design and the reports come online and in PDF format. Of course, there are integrations. The survey maker has a free tier, then starts at $29/m. Hotjar is a suite of survey and customer research tools. You can send out surveys to ask multiple questions. They have a feedback poll feature that pops up on your website to ask questions (in general or page specific) calculated to give you the most insights while reducing friction. You’re also able to research user behavior with heat maps and visitor recordings. One of my favorite features is the ability to set up conversion funnels. You can see where people are dropping off and spot areas for improvement. They integrate with most CMS with just a few clicks or a inserting a code snippet. Hotjar has a free tier with prices starting at $29/m. Aligning your content and searcher intent is an important factor when search engines are deciding what to rank on the first page. AnswerThePublic is a content marketing tool that gives content marketers insights into what people are searching for and the intent behind it. For example, if you’re searching for real estate, they won’t show you a specific vendor, instead, they’ll show you comparison lists others have compiled. They use autocomplete data from Google and Bing to give you a picture of search queries and trends. Type in your search term and it’ll organize the data into multiple categories such as questions, prepositions, related, and comparisons. It’s free to use with a paid plan priced at $99/m. Visual.ly is a matching service to visual and design freelancers, so you can tap into the visual marketing trend. The benefit of the platform is that they have a vetting and quality assurance process. So you can be sure you’re working with quality talent. The freelancers will make you visual assets including infographics, ebooks, presentations, videos, etc. With a portfolio to look through their past work. Each project is unique so there’s no pricing information, instead, you’ll have to ask for a quote. Buzzsumo is a content research tool to discover what’s popular with audiences in any space. It works by showing marketers the most shared content based on specific domains or specific keywords. Once you search, you can filter the results by format, date, length, and other criteria. They give you information about share count, the platform they were shared, and the backlinks they’ve gotten. After you know what’s working, all you have to do is create something better and distribute it far and wide. This is my favorite tool for guest posting content research. I’ll type in the URL of the website I want to pitch then find the most popular type of content. From there I can come up with something relevant or with a new spin and pitch it to the website. There’s a limited free tier and paid plans start at $99/m. This is an all-in-one SEO toolkit for marketing teams. SEMRush is strong in SEO and competitor analysis. Uncover backlink profiles, keywords you can rank for, people linking to you, and how your website stack up against the competition. Take competitors or relevant websites and input their URLs to find the keywords they’re ranking for. From there, create content that’s better (we don’t need any more mediocre content clogging the interwebs) and watch it rank. I’m just scratching the surface of what SEMRush can do. Sign up for their free tier and take it for a spin. Paid plans start at $99.95/m. Buffer is a content marketing tool that helps you distribute your blogging, articles and publications far and wide through social channels. They integrate with most popular social media platforms like Facebook and Twitter. It has built-in analytics which allow you to understand what’s working and what’s not. It also comes with a browser extension and a mobile app so you can schedule content whenever you find it. Distribute your own and curate from other brands around the world. Buffer has a free tier then starts at $15/m. Have you ever been on a site with lots of simple grammar and spelling mistakes? How does that make you feel about the people and products they offer? Yea, it doesn’t build a lot of trusty. Grammarly is an online spelling and grammar checker that helps you catch common errors. It also sends you a weekly digest detailing your word count, how you stack up against other users, and how dynamic your writing is. I just unlocked a badge for writing for 61 weeks straight. I’m working on the 100 weeks achievement. They have a Chrome extension that works on most websites as well as a Microsoft Word plugin. It’s free to use most of the features. Premium grammar checking starts at $29.95/m. This may not be exactly what you think about when you hear content marketing tool. That doesn’t take away from the fact that SlideShare is a great place to distribute content and presentations. No one ever said once you make content it has to stay in one format. If you see something performing well in its initial format, it makes sense to repurpose it into a presentation and upload to SlideShare. Add strategic calls to action to funnel people back to your website and collect leads. SlideShare is free to use. We all have different budgets, goals, and skill levels but want the same things – to build a successful business. With the right lead generation software, you’ll can develop a steady stream of contacts that turn into customers. There are many to choose from and not all of them will fit your goals and business model. This collection is full of the best lead generation tools available. It’ll help you narrow down your selection and choose the ones that will serve you well. If you have any other lead generation tools you’re using with great results then let me know in the comments – it may get an honorable mention. 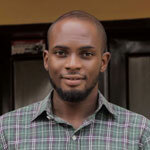 Daniel Ndukwu is the founder of KyLeads where he helps businesses optimize their lead generation while sending better messages that increase sales. When he's not working, he spends time traveling to as many countries as possible.